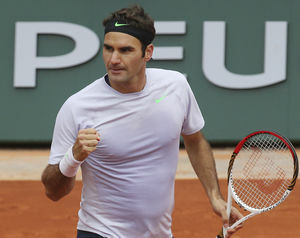 After a bit of a sketchy start, Roger Federer soon found his form against Julien Benneteau, someone who has caused Federer problems in the past, winning in straight sets 6-3 6-4 7-5. Apparently Benneteau was struggling with a bit of an injury - in fact, Roger said afterward in an interview with Pam Shriver that he (Julien) wasn't playing the way he normally does and he almost expected him to retire from the match. In spite of that, it was still more of a challenge than his first two matches so far at Roland Garros, which were basically just cruise control. This was his 899th win, so a win on Sunday would put him in an elite group of 900 wins or more. Interestingly enough it has been Rafael Nadal who has struggled more in his first two matches, losing a set so far in each one. It seems that some of the bigger hitting guys are getting the idea that if they just "go for it" against him they can trouble him a bit. But holding that level on clay in a best of five match is a different story. Apparently Rafa wasn't too happy that his match got pushed back to the next day after all the rain and he wasn't shy about letting the tournament organizers know that the reigning champion was a bit put out that his next round opponent got to finish his match the day before. The third round match between Novak Djokovic and Grigor Dimitrov should be an interesting one. Dimitrov was able to pull off a win against him just a couple weeks ago. My sense is that Novak will be the mentally tougher of the two in this one, wanting so badly to have the chance at the career grand slam. Will certainly be one of the more interesting ones. Finally I can't let pass the opportunity to post a couple pictures of the adorable Federer twins. The first one I just came across from a few weeks ago but they look so cute I had to share it. 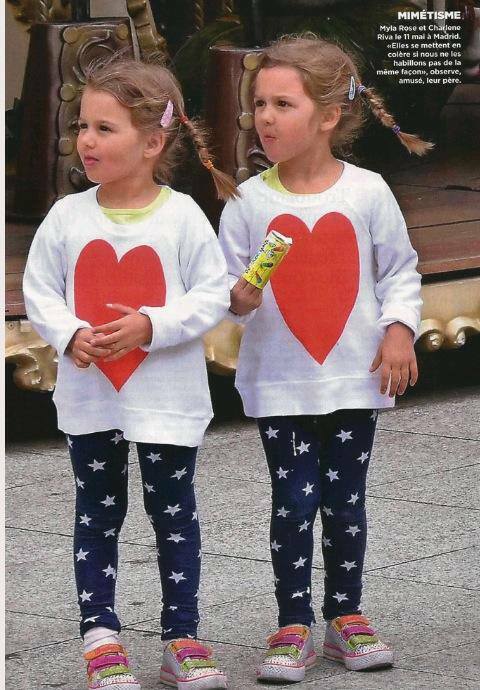 The second one is from their brief stay watching Daddy play his match against Benneteau. 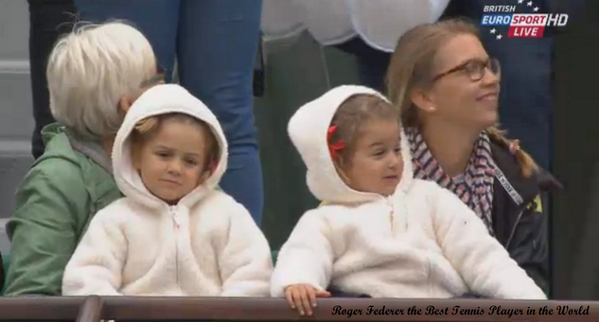 I love their white fur parkas in the cold Paris weather.